Gift Baskets are a classic gift for any occassion. Impress the best with this fantastic array of sumptious goodies! Gift basket includes: sparkling apple cider, a ten flavor assortment of Jelly Belly jelly beans, butter toffee pretzels, chocolate-covered popcorn, almonds, chocolate chip cookies, biscotti and Ghirardelli chocolate. It's the perfect people pleaser! This affordable gift basket is stuffed with a combination of fabulous chocolate sweets: an assortment of Ghirardelli chocolates, chocolate-covered sandwich cookies, chocolate-covered espresso beans, chocolate chip cookies and a chocolate-covered graham dunk... Wow! 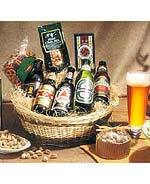 This two toned open band basket is filled with a few goodies and a variety of Ales to wash them down with. Bass Ale, Dos Equis, Heineken, Guinness Extra Stout, Murphy's Irish Amber, East Shore Specialty pretzels, Macy's Romano Garlic Cheesesticks, Hunt Club Snack Mix, Crown Jewel Popcorn, and Pacific Gold Pistachios. Due to the alcoholic content of this gift, an adult signature is required upon delivery. Prices shown include shipping costs A complete birthday party in a basket! This cheerful gift features a Birthday Bear, birthday party horn, luscious Tortuga Rum Cake (4 oz) and Birthday Candles, Happy Birthday Fortune Cookies (2 oz), disposable "Party" Camera (27 exposures), 3 Ghirardelli Chocolate Baby Bars, and Caramel Almond Popcorn (8 oz). Gift measures 12" x 12" x 10" and weighs 3 lbs. Our most impressive gift offering for any occasion you can think of is our Presents design basket. We've taken this large, reusable willow basket and packed it with gifts of tasty eats for your lucky recipient. There's a giant box of our famous chocolate drizzled caramel corn and a big box of chocolate chip cookies with pecan pieces. There are Presents boxes of luscious chocolatey Myrtles, nine of them, and"white chocolate" covered Bavarian pretzels, four of them. There are assorted bags of popcorn including jalapeo, white and yellow cheddar and sweet, salty kettle corn. They'll have a fiesta with the crunchy tortilla chips and salsa. Other savories include honey roasted peanuts and garlic herb pretzel nuggets. Candies are super sour stars, fruit flashers, and foil wrapped chocolate stars! A galaxy of star treats for your star recipient! 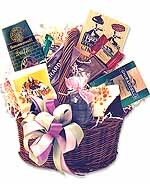 If you have another gift basket in mind check out our other fine partners gift basket selection.